PMC designs feature its uniquely engineered Advanced Transmission Line/ATL™ technology, which provides high resolution, wide bandwidth signal response across the complete product range. Proprietary drive units, electronics and cabinet engineering provide unrivalled tonal accuracy, clarity and dynamic range throughout a range of designs. PMC monitor systems are in service with most of the world's premiere music and film studios, broadcast companies, post and mastering facilities..
sound playback across a wide area." - Jim Anderson. Irvine, CA- The world-famous Clive Davis Department of Recorded Music at New York University attracts the brightest students to its four-year BFA program. The university responded by providing the best surround monitoring systems currently available: a state-of-the-art MB2 5.1 powered by Bryston 14B and 4B amplifiers, plus an active TB2S-A 5.1 playback array. The Clive Davis Department of Recorded Music's larger Studio 510 control room is equipped with an API Vision Analog Surround Production Console, with space within the sweet spot for up to 30 students. "We needed a sound system capable of delivering accurate sound playback across a wide area," says department chairman Jim Anderson. "We are very pleased with the consistent sound produced by the MB2 5.1 system, and the TB2S-A 5.1 array we installed in the smaller Studio 505," which features a Solid State Logic SL-9000 K-Series analog console. Four years ago, the Tisch School of the Arts at NYU received a $5 million donation from Clive Davis to create the brand new department. Davis is a veteran music producer, the founder of J Records and currently chairman/CEO of BMG North America. Studio design for the new NYU facility was by Sam Berkow from New York-based SIA Acoustics. Recording duties are handled by Digidesign Pro Tools|HD workstation rigs and Studer A827 analog 24-track machines. The PMC MB2S is described as perfect for mid-sized control rooms either soffit-mounted or on custom studio stands. MB2S monitors allow higher sound pressure levels without distortion and loss of definition normally associated with systems of this size. The design uses a PMC75 mid-range soft-dome and Radial(tm) low-frequency drivers; the latter allows massive controlled excursions and, by cooling via a cast alloy exoskeleton and new rear-vented magnet, avoids the effects of power compression. As with all PMC surround-sound models, a matching MB2S-C low-profile center channel and subwoofers are offered. "We hold a Critical Listening Class with our students in Studio 510," Anderson continues. "Our classes really could hear subtle differences between recordings, which enables us to perform interactive discussions on the quality of recording techniques, performances and special effects being achieved during our practical sessions. The PMC monitors are full-range, high-resolution systems - just what we need for delving into the intricacies of a mix." "We started this journey in the Fall of 2003," the department chairman concludes, "and with last year's entering freshman class, we saw ourselves at full capacity of 100 Department of Recorded Music Majors. In May 2007, the department came full circle and celebrated its first class of seniors to graduate and begin their exciting new careers in the music industry!" 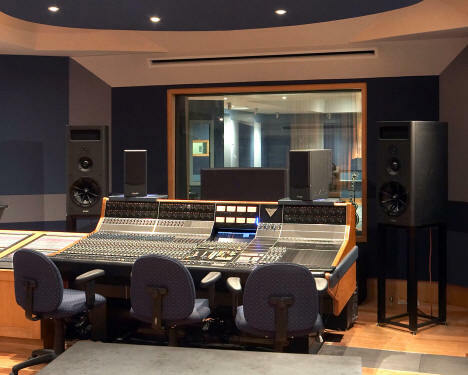 PMC MB2 5.1 Surround Sound System in NYU's The Clive Davis Department of Recorded Music's Studio 510 control room, which is equipped with an API Vision Analog Surround Production Console. The array is powered by Bryston 14B and 4B amplifiers.